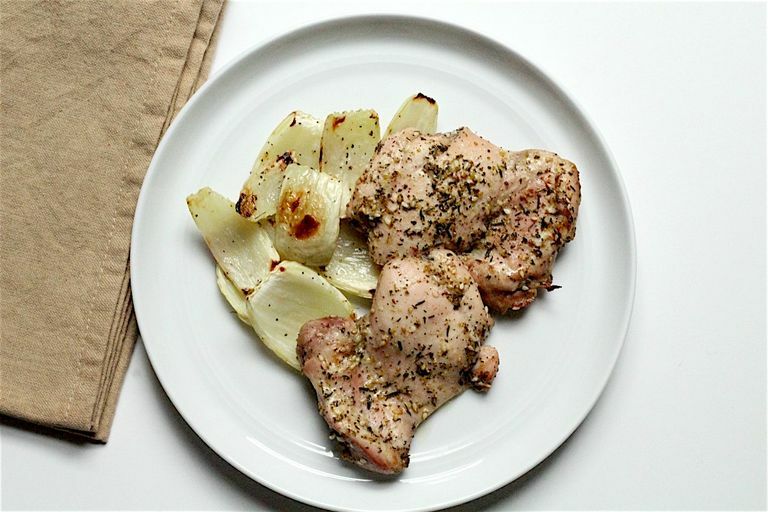 This recipe for roasted za’atar chicken thighs is safe for those of you who need to follow a gluten-free diet. The Middle Eastern spice is actually a combination of different herbs and spices, giving its unique flavor to any dish. Pair these chicken thighs with a side of vegetables, salsa, and/or whole grains for a satisfying meal. In a large mixing bowl, add chicken thighs. Pour in the olive oil, lemon juice, za’atar, sesame seeds, and sea salt over the chicken. Mix thoroughly so all of the chicken pieces are evenly coated with seasoning. Place chicken thighs on a foil-lined baking sheet and roast for 25 to 30 minutes, or until golden brown on top. The herbs and spices along with lemon juice in this gluten-free recipe will have you needing less salt. If you are not a fan of za’atar seasoning, simply replace it with another spice of choice. Chicken pairs beautifully with most herbs and spices so the options are endless! Some delicious alternatives to za’atar would be thyme, oregano, and/or rosemary. You can easily swap chicken breasts for thighs to make the recipe lower in fat. Replace the olive oil with sesame oil for an Asian-inspired recipe and rich, nutty flavor—this would go well with the sesame seeds. Although Za’atar already tends to be a little smoky and zesty, you can try adding some crushed red pepper flakes or hot sauce to kick things up a notch. To make life easier, you can marinate the chicken in a large plastic bag in advance and keep it in the refrigerator for a few hours. With the other unused half of lemon, you can slice it into full circle slices and place one on top of each chicken thigh before placing in the oven. This will help keep the chicken even more moist and take the lemon flavor up another notch, along with vitamin C.
I always like to use foil or a silicon mat when roasting or baking, for easy clean-up. If you enjoy a good crispy, golden top to your chicken, turn the oven to broil after it has been cooking for 20 minutes. Keep an eye on the chicken to prevent it from burning. This dish pairs wonderfully with any side dish and/or whole grain. I recommend pairing the chicken with some roasted vegetables and/or a quinoa salad. Try roasting some fennel with olive oil, sea salt, and black pepper, for example. Roasting fennel brings out the natural sweetness. Utilize leftover thighs by dicing them up into cubes and making chicken salad, swapping in plain Greek yogurt for mayonnaise.